Quantum physics tells us that reality is far beyond human perception and intuition. In other words, our rational mind and common sense are just not capable of understanding the true nature of reality. So Einstein’s famous theory has one absolute (speed of light) in a relative universe, and it forms a kind of boundary around all we can know. Even though this theory has been borne out by many experiments, its consequences appear very bizarre. Objects shrink when they are in motion, space time curves, light is bent by gravity etc. After formulating his theory of relativity, Einstein spent the rest of his life trying to find a ‘unified field theory’. In other words he was trying to tie together the workings of the physical world in one theory or formula, a theory of everything. To this day, scientists are still searching for a way of integrating the theories of quantum and relativity, for as far as scientists are aware at present these theories contradict one another. To the scientific imagination a contradiction cannot be built into nature, it must be in our minds. 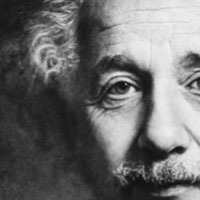 Even though Einstein had a deep sense of the mystical or spiritual, he refused to let go of his classical insistence that a rational explanation or theory could be found, i.e., the world was accessible to human reason. This dilemma for Einstein can be seen when he said that he believed in the possibility of expressing everything scientifically, but contradicted himself saying that such an expression would be meaningless when describing a Beethoven symphony as a variation of wave pressure. Of course the meaning and effect of the music would be missing. Chaos theory seems to fit into the picture at this point. It is in essence a reversal of the classical view that the physical laws are what count, and local disturbances are relatively trivial. In chaos theory local disturbances can be ultimately overwhelming and, just as important, we cannot tell when they are about to overwhelm us. A strange concealed order has been revealed by chaos theory. If we run large numbers of variations of simple equations on a computer, patterns emerge. The most famous of these patterns is the Mandelbrot set. Every magnification of the pattern reveals more elaborate layers made up of shapes like gingerbread men linked together in swirls, repeating in more and more complexity. These patterns seem to illustrate infinity, and the gingerbread men seem to represent the incredible creative and energetic complexity of reality. I hope I have sufficiently described these three theories (Relativity, Quantum, and Chaos) to give the reader some insights into how all is not what it seems. The world is indeed stranger than anything our rational mind can grasp. The more we explore these “new science’ avenues, the more illusory our universe seems to be. I feel that we must again look at some Eastern concepts because they seem to be more and more relevant as we explore the mysteries of “new’ science. The more I have reflected on the meaning of the “new’ science of quantum, relativity and chaos, the more it has reminded me of the ancient Indian traditional concept of Maya. This next observation should be viewed in a very general open minded way. It is not intended as any kind of conclusive proof, but purely as a glimpse of something which may help in our search for clues. In the field of higher mathematics we find Godel’s theorem. In very simple terms, it states that it is not possible to know everything about a particular situation from within that situation. In other words, one must be in a position outside the arena of specified activity. As our viewpoint of a particular situation widens, there will always be an even deeper perspective which will give yet more information. It is not possible in the rational world to reach that point where the highest perspective has been reached. In mathematics it applies to axioms in mathematical theories, but I feel it applies in more general situations. An example would be, where someone is sitting inside a building with no windows, which is balanced over the edge of a cliff. All observations and calculations from within the building will be totally incapable of determining the fate of its occupant. But to an observer outside, the situation will be very obvious. I have read several top selling books recently which try to explain God and reality in scientific terms. The authors are all eminent scientists who give incredibly in-depth theories, calculations and hypotheses. These books can be so intense and technical that after a few pages, one’s head is “completely in a spin’. These types of books possibly satisfy the intellectuals, giving them “mind fodder’ and mental exercise. It strikes me that this is a situation very much in keeping with Godel’s theorem. Intellectuals can delve into the most intricate, complicated theorems and calculations, but they will never understand the “big picture’ from within the confines of their “rational perspective’. It is only when they step outside the world of the “physical illusion’ that the “web of Maya’ will begin to lift. Sages and seers in ancient times who spoke of the spiritual side of nature, gained their insight by moving beyond the confines of the rational physical world. In a similar way to the principles of Godel’s theorem, the ancient mystics gained access by deep meditation to a perspective beyond the physical, in order to attain a more complete picture of the physical realm. In other words, when we are within the illusion of physical reality it is not possible using its own internal methods and concepts to fully understand it. By accessing or looking from a higher level of awareness beyond the boundaries of the “physical illusion’, we escape the constraints imposed on us by the finite physical world. To a rational scientific person this may all sound like something out of a science fiction novel. But remember that I stated earlier in the book that unless we can relate physically to our ideas, they are not reality for us. At this point I would like to introduce what in my opinion is a kind of “unified field theory’. This is what Einstein searched for in vain. The reason for Einstein’s failure, is that access to it is beyond mathematics, test tubes and intellectual activity. The intellect can merely confirm its operation. This theory cannot be accessed with the rational mind, although the rational mind can observe and confirm its operation. The “Param Chaitanya’ or all pervading power which exists throughout the universe is the elusive “unified field’ for which Einstein searched in vain. It encompasses all of the physical cosmos, and also the realm of the spiritual or Virata in Eastern tradition. Its basic units of propagation (in simplistic terms) are what can be called “vibrations’. At last mankind is at the point of conscious interface between the physical and spiritual. This interface is entered without effort or thought, it is spontaneous and natural. It can be felt via the central nervous system as a physical sensation, it is an actualisation, not something imagined as a theory or concept. From Fortune magazine, August 22, 1994. Article entitled, “Leaders learn to heed the voice within’, by Stratford Sherman.